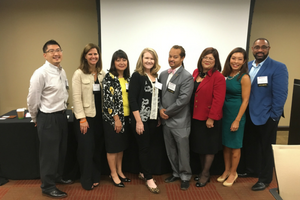 On August 30, 2016, the California Diversity Council hosted the 2nd Annual San Diego Multicultural Leadership Roundtable at Ashford University. Roundtable attendees gained knowledge and advice from corporate leaders who shared insight from their personal success and leadership experience as professionals. The roundtable began with registration, breakfast, and networking at 8:00 a.m. Our featured group of panelists lead discussions covering topics such as “Overcoming Perceptions & Stereotypes,” “Interplay of Personal & Professional Success,” and “Developing Political Savvy.” Attendees also had the opportunity to share their thoughts following the presentation of each topic. The California Diversity Council would like to thank all the sponsors, speakers and attendees for helping to make this event a success.